There are simple joys to be found in the most ordinary things--sharing a cup of tea with a friend, building family traditions, feeling God's whisper in a gentle breeze. Sweet and touching, this book celebrates all the small wonders of life and illuminates the breathtaking moments when an ordinary day is transformed into extraordinary by a simple act or unexpected blessing. Sometimes the simple joys of a relationship or season turn out to be the biggest miracles of all. 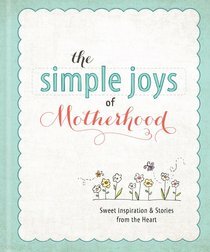 About "The Simple Joys of Motherhood (Simple Joys Series)"